Disgraced former MK smuggled cell phones to terrorists, including murderer of Moshe Tamam. 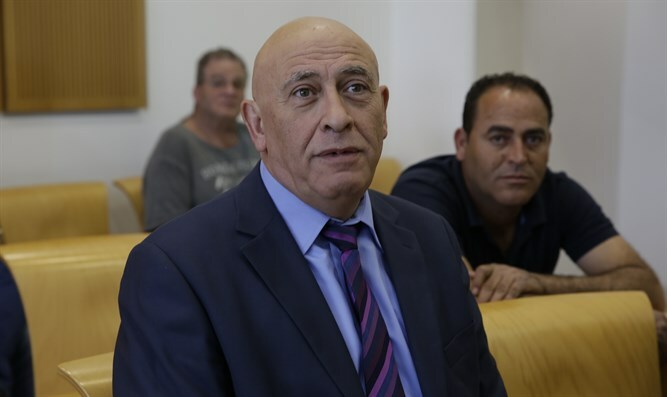 An Israeli court Sunday sentenced disgraced former Joint List MK Basel Ghattas to two years in jail for aiding terrorists jailed in Israel. The conviction was part of a plea bargain agreement accepted by Ghattas, who was found late last year to have smuggled cellular devices to terrorists – including convicted murderers - being held in Israeli prisons. Ghattas also served as a courier for the terrorists and their confederates outside, carrying messages between them. As part of the plea bargain agreement, Ghattas resigned his seat in the Knesset, eliminating the need for a protracted expulsion process from the legislature. In exchange for his pleading guilty and resignation from the Knesset, the prosecution dropped charges of terrorism and endangering state security for which he could have faced up to 10 years in prison. In addition to the reduced sentence of 24 months he was fined 120,000 shekels, ($33,300) according to the transcript released by the Justice Ministry. after his prison term ends. His lawyers have 45 days to appeal. The court ordered the 60-year-old Arab Christian to begin serving his sentence at Dekel prison in Beer Sheva on July 2, granting his request not to be jailed until the end of the Islamic fasting month of Ramadan as he will be confined with Muslim prisoners. Media outlets reported that 12 mobile phones were found in two separate prisoners in searches after Ghattas visited the high security Ketziot prison in December, using his parliamentary immunity to avoid being searched. One of the prisoners is serving time for kidnapping and murdering IDF soldier Moshe Tamam in 1984.